There's always a lot going on out there in the world of internet marketing. From news about Facebook, Twitter, and LinkedIn, to vague press releases about SEO and content marketing, it can be hard to distinguish what's going to make a lasting spark going forward. That's why we decided to keep our eyes open all week for some of the most ground-breaking stories. Here are the five that we deemed some of the most important. 1) Women Use Social Media More Than Men. Bottom Line: In 2010, Forbes reported that 57% of Facebook users are female, which makes for about 46 million more female visitors than male visitors. But don’t forget there are still millions of men on Facebook too. Create content that appeals to and engages your audience. Make it easy for them to share with their networks. 2) Mobile Users Suffer from Hyperactive Bouncing Disorder. Strangeloop showed that people accessing the internet via mobile devices aren’t exactly the patient type. Impatience is a growing trend – just 20% of mobile users said they left a site after five seconds in 2009. In 2011, 74% said the same. Bottom Line: To be mobile-friendly, think of marketing like a ginger bread trail -- lead website visitors and newsletter subscribers deeper into the site with bold, intriguing headlines and a single, powerful image. Bottom Line: Nothing shows that 2011 has been the Year of Social like this chart. 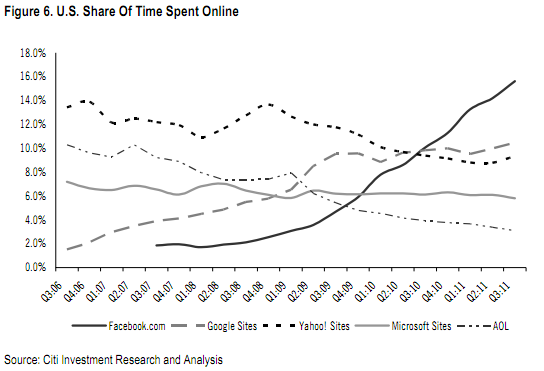 Toward the end of 2010, Americans had equally divided their time between Facebook, Yahoo! sites and Google, but Facebook has left competitors in the dust. If you haven’t yet set up a Facebook Page for your business yet, what are you waiting for? 4) Anonymous & Miscellaneous Reviews Cause Definite Results. Bottom Line: It’s more important than ever before to make sure you form a connection with customers through email marketing and social media, and this may increasingly mean going out into the online review-o-verse to speak directly to happy or dissatisfied customers. 5) Lack of resources, strategy, and content – oh my! Bottom Line: Marketing, especially internet marketing, is becoming more and more important as companies become more and more strapped for time – my three quick fixes would be to find a software solution for time and budget management, design a strategy around what you hear on social media and in the news by filling a need, and use those same topics to create or position content accordingly. And don’t forget we provide the resources to make marketing your business as simple as possible! What internet hot topics caught your interest this week? Share them here or on our Facebook Page!